I guess most quilters have realised their hobby isn't as safe as people might think, but last night I managed a new, to me at least, accident. I turned one of the rollers wit wind on a quilt and something in my hand made an odd noise. Something in the gripping and turning has done something interesting inside my hand, I don't know what but I know it hurts. I was sensible and stopped quilting to rest my hand. I've tried to keep it warm and not do anything to stressful but it still doesn't like me. Who would have thought that rolling an quilt could be so dangerous? I guess I will have to add that to my list of things not to do. The worst part is having to explain to people how I have injured myself, why couldn't it have been something that sounded more exciting? The last couple of bulbs that have blown in the light fitting our my longarm have taken out the fuse as well. The extra step or replacing the fuse means I don't replace the bulb so fast, yes I really am that lazy about some things. It did mean though that I got to see a quilt illuminated by the machine light alone, and it looked good. The quilting was so clear I couldn't believe it. So I waited for it to get dark last night and had a play with my camera. It's tricky fitting the tripod in, and I really needed it for some of the exposures I tried. I found that that inbuilt white balance was having a hard time compensating for the bulb on the machine, I guess there is something odd about the colour spectrum of it. It's probably the same thing that makes it so good for seeing what I am doing when I a quilting. Anyway here are the results. 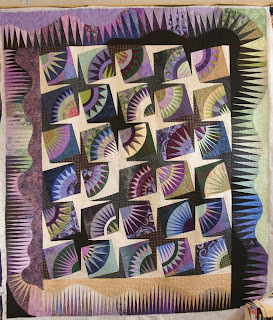 The quilt on the frame belongs to Jenny Stafford of Patchwork Corner and is a sample for one of her kits. She is planning on taking it to the Malvern show next week to illustrate the kit, so it will be delivered early next week and I will show you the full quilt then. It is an all over pattern of swirling feathers. I've really come to enjoy this design after being quite scared of it for a while. The tape you can see is marked in inches which will give you some idea of the scale. The squares are quite small and I will have to ask her how it is done, as the pattern is quite intricate when you really look at it. I know Jenny though, there is bound to be a clever way of doing it. Now as promised the picture of the sample I was working on at the shop on Thursday. This will be one of a set of three panels that form a wall hanging when I have trimmed it and bound it. I am not sure yet if I will quilt it. I have a couple of ideas for designs to put on it but I rather like it as is and in a wall hanging it should be OK without the wadding. I will probably leave my final decision until I have all the parts made an then see what they have to say about it. I prefer to listen to the quilt before deciding how to quilt it if I can. Just in case it isn't clear this isn't just a piece of fabric. 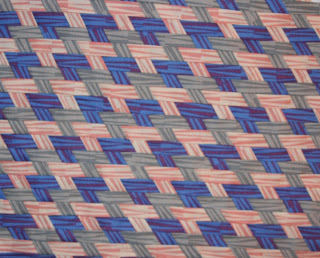 It is woven from strips of three different fabrics in the Glorious Geisha range. Yup after a day of shop siting the shop is none the worse for wear, as far as I know. I discovered that I don't know where every bolt lives, and customers have a real talent for finding the thing I don't know about. I've discovered that shops are empty or full. There is never just one customer, and as soon as someone walks in the phone will ring and a delivery will arrive. Why are so many shop staff female? Could it be related to the need to do three things at once? The till only got upset with me once, and I only panicked once, so I think it went pretty well. I was so pleased every time a customer asked about fabric colours or calculating requirements, that I am confident I can deal with. On the bright side I did get to meet a lot of quilters. It was great to see their projects and talk about their plans. Just being able to chat to like minded people is great, especially as my work is generally quite solitary. I loved being able to work on class samples in the shop, it seemed easier to get down to work when I was in the right setting, even with the frequent paused to server customers I think the sample went quicker than it would have done at home. I will try and get a picture of it later. I will be looking after the shop again on Saturday 3rd November. I think I am looking forward to it. I am certain that running a shop isn't something I could do full time, but once in a while it's quite fun. I really enjoy having the chance to get insight into what is involved in other peoples jobs, I not only understand them better but it makes more appreciate my work more. I could not deal with that amount of juggling every day, credit to those who can. Now on a lighter note, blogger suggested this site to me today when I logged in. I don't normally follow the links but this one intrigued me, The “Blog” of “Unnecessary” Quotation Marks should appeal to those language pedants among us, although I am sure it will frustrate as well as amuse. People do abuse punctuation terribly (yes even worse than I do). Well I am off for my first day of shop sitting. It's kinda scary but I think I know what needs doing now. If you are out and about in Hemel today please pop into Patchwork Corner and say hi. Friendly faces will be very welcome. Well what a wonderful experience. I loved having my quilts photographed. It is quite amazing how much better they look when they are hung well. There were a couple that I really didn't rate when I have seen them hung at shows, but when properly supported they look so much better. It was odd to find I didn't know some of my quilts as well as I thought. 'Where is the North Star' turned out to be a lot bigger and more red than I remembered it. Rather embarrassing as I asked if we could do it when we had finished as an extra, I said it was smaller than 'Guide Me', well I thought it was. For some reason I was sure it was a large single, rather than the nearly King size that is actually is. Oh and if you want to think about photographing your quilts, you might want to minimise the amount of red purple you use, it seems to be a very tricky colour to photograph accurately. I know I won't have the finished product for a while, but if today was anything to judge by this is going to be very good value for money. It is amazing how useful it is to have an experienced photographer who is used to looking at quilts. He could see great closeups that just didn't occur to me. His knowledge of lighting quilts and tricks for getting the best from there is not something I could learn in a hurry, or indeed reproduce if I wanted to. I don't know if you can tell but I am very excited about having these pictures. Rest assured, I will share some small versions of them once I get them. I am looking forward to being able to put better pictures in my online portfolio. I also have a new project to work on, one of the closeup shots will make a great small project. I do wonder how people manage to get things done when I see how stunningly organization fails, and how often. Things that seem fairly simple to me seem to cause an awful lot of trouble. Maybe I am just hopelessly naive. The latest thing to bring this to my attention is the hospital catering. The patients are given a form to choose their meals each morning. They have four main dishes and two deserts each for lunch and dinner. Two days in a row my friend has been told at lunch time that she can't have her choice of dinner because they don't have enough. OK supply problems hit anyone but the same person not getting their choice two days in a row seemed a little unfair. After some digging we found out that the meal choice in question had run out the day before, so when they were handed the selection forms there was none of that item to be had. So why offer it? Although I am still not quite sure why they keep low enough stocks to run out, especially when the staff know this happens fairly often, I really don't understand not crossing it off the list. It seems to me they just made themselves more work having to go and ask for another choice from everyone who had asked for the out of stock dinner. Besides when the whole range seems to be about eight items and they are all frozen and then microwaved, why not keep more stock of the popular items? Anyway, tomorrow I am taking a day off from dealing with the hospital. I am off to Bristol to have some quilts photographed. I met Christine Porter at the Festival of Quilts, and she mentioned that her husband does quilt photography. As I have a couple that are very tricky to photograph well, I thought it might be time to call in a professional. It was surprisingly difficult to choose a selection to take. There were four no brainers, but if all goes well I could get eight done, so I need to take them with me. That is where it gets harder. Do I take those I think will make the best postcards, or the ones I am most likely to make patterns of? Or maybe I should try and work out which ones are most likely to end up in shows? I guess whatever I do I will find one I shouldn't have left out and one I never use, so long as I got the others right I think I can live with that. Two I would have chosen are off on their travels, so I guess when they come home I will have to book another session for them and then I can catch any I miss this time around. So wish me luck with the traffic and hope the quilts all hang as well as they can. Well, where to start. I was very pleased to discover, rather late last night, that one of our local hospitals hangs art quilts in it's halls. There was a really striking piece about the RAF (I think). I will go back and try and see if it has a makers name on it. If it is yours and it has some other meaning I haven't come to terms with I am really sorry. I had been there for many hours with a friend, and I spotted it as she was being taken to her ward. Fortunately my friend is also a quilter and an artist, so understands when I get distracted by things like that. About 3am we had come up with several ideas for quilt inspired by hospital visits. Oddly some still seem like a good idea. Having had far too little sleep and spent too much time at the hospital I am off to bed. I will get in touch with everyone as soon as I can but my friend it likely to be in for a while and doesn't have many people who will visit. The best way to contact me at the moment is by email. Finally, I can show you the quilt I have been enjoying so much for the last week. 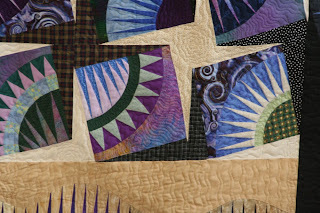 The pattern is one by Karen Stone, as as with many of her patterns, is wonderfully spiky. This particular quilt top was made by another Karen and is a birthday present to herself. Her husband bought her the pattern and the fabrics last year, and if all goes well it will be finished in time for her birthday next week. I am so pleased it is going to a great home where it will be loved. I think it has twelve colours of thread in it. I didn't really keep careful count as I just chose the thread as I found places that needed a new colour. I didn't want my quilting to shout. This pattern can carry the glory all on it's own. 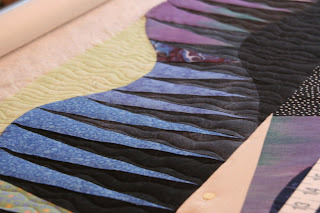 As I worked on this quilt I enjoyed the different textures of fabric in the top. Apparently my method of moving my machine if very unusual, but it works for me and I like having contact with the top. My hands tell me things my eyes don't. The plain dark green fabric is wonderfully soft, although it doesn't look out of the ordinary. Apparently it is a silk blend, so it isn't surprising it feels good. 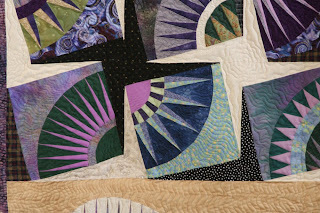 As soon as I saw the quilt I felt I needed to enhance the spikes, so as I worked I tried to make those pointing outwards in the blocks stand out. To achieve this I quilted the spaces between them and allowed them to rise up. This had the side effect of giving each type of spike a very different feel. There are plump soft spikes and very sharp hard ones. I hope that at some time in the future someone will 'view' the quilt with their finger tips and appreciate the patterns from this perspective. I will have to make myself one of these quilts, or at least something similar. I rather like tie idea of designing something unique, I love Karen Stones patterns, but I like to be different. If nothing else I want to scale it up to a good king size quilt so I would have to draw my own borders. I've got to come up with something, I really miss this one. Strangely even more than ones I have made and sold. I wonder why some quilts grab me so much more than others. I wish I could work that out as it would probably be a good way to create popular patterns, but until then I will have to carry on with trial and error. Hmmmm, it seems blogger is having some problems so I will have to add the pictures tomorrow. Sorry guys, but they do say they are working on it, so hopefully it won't be long. After several attempts it has allowed me to put up one image. 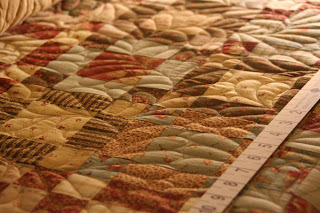 This is a picture of the quilt on the frame when I was working on the first border. I had intended to take more pictures as I went along, but I got so absorbed by the quilt I entirely forgot to take the pictures. Still maybe it will serve as an appetizer until blogger starts working properly again. Yay, finally I have the pictures up. Enjoy. People often ask me where I get my ideas, I answer everywhere, it's pretty much the truth. They all tell me how wonderful that is, but it does have it's moments. Last night I came up with three new ways to do machine applique. Any of which, if they work might make what I do look more like traditional needle turn, which would be great. The problem is I really don't have time to play with them right now, but they will distract me until I do. Pah! I guess I will write them up and hope they will leave me along while I get some quilting done. Ideas, they really are a double edged sword. 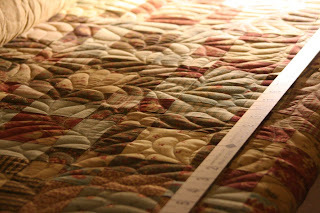 I've just finished my quilting for the day, and turned off the light in the room with the longarm. I will finish the quilt on the frame tomorrow, and I am sad. I have really enjoyed this quilt, so much so I have taken longer over it than I really needed. I have savoured it, and in doing so planned my own version of it. For the first time I will be sorry to hand back a quilt. It's very strange, in so ways I am more attached to it than to some of my own. On the bright side, I know the owner loves it at least as much as I do and I am pretty certain she will like the quilting I have done. In fact it is also the quilt I have been most confident about. I wonder if that is because it speaks so clearly about how it should be finished, and I have been able to accommodate it's wishes. Well once I have handed it back on Wednesday, I can show you and maybe you will see why I have enjoyed it so much. The reason I was finishing so late is I managed to open a new bank account today. I've been putting it off for a while, even though my bank had been providing less and less service. I tried a while ago to move my personal account and none of the banks were in the least bit helpful. When I opened my business account they were ever worse, actively misleading me about the facilities I would receive to persuade me to open their accounts. So banks are not my favourite people to deal with. However I would have to admit the people I met today were pretty decent. Of course I haven't actually tested the account yet, so they may have told me a lot of rubbish, but I have a good feeling about this one. It did take 3 hours though with I could have done without. Still, if it does work I will be a lot better off, and able to write cheques again, and I don't think it would be possible to be more hopeless than the account I have been trying to use. I am also looking forward to being able to write to my ex-bank and shut my other accounts, explaining exactly why I won't be doing business with them again. I suspect they won't be surprised, today they were surveying customers leaving the branch, and had put on extra staff who were behaving very differently to usual. I know I wasn't the only one who was getting a bad deal, but waiting until I get desperate enough to move my money is no way to run a business. I've loved the last week. I've been rushed off my feet nearly every day and it's bee a thrill. I've been able to return lots of work to customers, which is always good, if scary. I've taught and talked to so many people I feel on top of the world. I hope the world it going to be soft and warm though, I feel I need to sleep for a week. I've learned that I really do like to be going flat out when I am doing things. I like almost too much to do, I hate being bored. Then when everything is done and put away, I like to sleep. Right now I feel I would like about a week off, but I bet tomorrow I will be off and at it again, after and early night and a late morning. Yes for me this is still looking like and early night. Thanks to everyone I've met this week, you've all given me ideas and inspiration, now I will go and ponder them lying down. No one told me that even when you love it teaching in particular is really tiring. Yes I know, I am too young to be complaining of aches but this morning I feel like I was run over by something big and lumpy. Next person to tell me quilting isn't a physical sport will get such an earful. I had a busy and very interesting day yesterday. Tuting (that must be what a tutor does right?) at Patchwork Corner, then collecting and delivering quilting. That in itself was a pretty good work out hauling lots of stuff about, but I rounded it off with a talk to Connecting Threads quilt group. Their venue is lovely, it is the library of a large school. Unfortunately the car park if some way from where you speak and I take quite a lot of quilts. I feel guilty getting others to carry the really big bundles I take so I like to take the biggest of them. So I am paying for it this morning. They were a lovely group though and several of them helped carry everything back to the car. Just as well I don't think I could have done it having held them up during the talk. It's funny to meet a group who are based so close to me but that I had no idea existed. I wonder if there are more nearby? It is very hard to find out what is going on when you aren't already involved. Still they kindly invited me to go back as a guest next month when they have their Christmas party, and I think I will. It would be good to get to know some really local quilters. They also reassured me that venues near me are indeed expensive. I thought I had looked pretty well, but it was possible I has missed something good. Sadly no, I would love to run a group or some workshops in Harrow, I know there are a few quilters about, but who wants to pay hundreds of pounds to rent a room for a few hours. It just isn't practical. I will give the Arts center another try though, given it has new management. Maybe they will have something reasonable to offer. This morning I have had the chance to break out a thread I never expected to use. A while ago I decided to buy the whole range of Masterpiece threads. I use them a lot and I guessed I would use most colours eventually. One that didn't seem likely is SubLime, you can probably guess what colour that is. It is a real lime green, but on this quilt it is perfect. It doesn't look loud or bright at all, I am so pleased I had it in the drawer. In fact I suspect this quilt will use a lot of unusual threads, and I can;t wait to get back to it. So off to it. too I have summarised it here. The first thing after booking a venue is to get a press release written and out there. I was surprised that it needs to be done ASAP given my show is only five months away. Apparently this is very short notice in the press world. This one piece of advice was worth asking for. It scares me that I would have happily waited a couple of months before worrying about this. Advertising, this needs doing now too. I need to be thinking about brochures and posters. I need to prepare my mailing list and start thinking about who needs to be invited to the private viewing. Select work carefully, less is more. This was phrased in many ways by different people. I think the general message is only show my best work and try and make it one coherent voice. If it has different tones, then split the venue into regions and hang like with like. An interesting rule of thumb for selecting the amount of work needed was to aim for half the linear wall space to be covered. Great and specific advice, as I scientist I love something this precise to work from. Be prepared to take advice, again this was voiced in many ways, but the two that stood out to me were listen to the gallery director and ask them for advice. Also get a trusted friend to double check the show and be prepared to change it at the last minute if needed. Insurance, for some reason that had never occurred to me but it is rather important to make sure the work in covered when on display. Have a guest book. Again a fantastic idea, not only can I use it to collect details of the people who are there but it might be a good memento of the event, and I doubt I would have thought of it. Get help, not for being nuts enough to do this, but to help man the show, hang work and generally assist in making things go well. Not entirely show related, I was given advice on how to handle complements. I don't know about anyone else but I find that very difficult. However I can manage to say thank you and the tell them something interesting about the work. Thank you for that one. Finally, feeling like a fraud is exactly right for this situation. Good to know I've got something right. I just have to carry on and ignore it. I am sure there are going to be a lot more things I find as I go along, but this advice should help me avoid a few of the mistakes I was about to make and hopefully make this work. I am feeling a little more calm about it but boy it is one heck of a learning curve. I hope these hints will help other too. If you think of things I have missed please let me know and I will add them to the list. Before I start the post proper, let me apologise for the gap in posts. My ISP has been playing up and I have been mostly without Internet access for a few days. It is scary how cut off this can make you feel when you work from home on your own. I have got so fed up I am now writing the post offline in the hopes that I will be able to cut and paste it if I do get a short burst of access. Anyway, I have been very busy quilting for others recently and that means lots of time to listen to books. I have finally finished going through the whole Harry Potter series and have started work on Robert Heinlein. much this has influenced me, without me really being aware of it. television on or listen to a book when I am working. I find music very distracting, as I see all sorts of designs from it. There are two albums by one band which I would like to produce a whole series of quilts from. I haven't started it yet as I feel I should ask the musicians before I do it, given I would be making so much work from it that I think the source would be obvious. I just hope I have enough time to make all these designs I am coming up with. Wednesday, when did that happen? I can't believe it is Wednesday already, and that I haven't been able to blog got two days. On one hand it is great news, I am madly busy, which is good. On the other hand I miss being able to post and have pictures to go with it. I have been making things but rather foolishly I have left them all at Patchwork Corner and I forgot to take photographs. On the 20th October I will be teaching a Christmas class. We will be making quilted cards, ornaments and wreaths. They are a lot of fun and there should be enough time to finish them before the holiday. I made the card and baubles this week and I will try and get pictures tomorrow night when I go to teach. I've also put the next two borders on my birthday quilt. I am very pleased with how it is growing. I just need to find time to draft the outer border which I will foundation piece. I can't see me having time to do that for a while so I have left that there to show an alternative use for the Graceful Geisha panel. I think it has so much potential when you look at it as a nice bundle of fabrics, but it is mostly shown as a way to create the Geisha portraits. I hope it will prompt others to make quilts that use it as many fabrics. I've started some more woven panels, but I will have to wait until Sunday to have time to work on them again. This Saturday is the Autumn regional day of the Quilters Guild (region 7). It is at Leverstock Green Village Hall, and will have Margaret Johnson and Carolyn Gibbs speaking. I am looking after the raffle there and presenting what I learned from my bursary. I feel I need to prepare some words to put with my display there. I also need to make the raffle prizes look pretty. That and the customer work I have on will pretty much fill the rest of the week. It also looks like I have a few small issues to fix on my web site, but it is nice to know it is on our own servers so we have some control over whether it is up and available or not. Thanks to everyone who has helped me by testing it. It is very much appreciated.